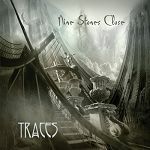 RockUnitedReviews: NINE STONES CLOSE: "Traces"
Man, what's up with ProgRock Records and their releases as of lately? First I had to listen to the (fine) Greylevel disc and here's yet another utterly melancholic act? I simply won't bother getting up from bed this month then? Reading through the press-release certainly won't cheer you up, it's, and I quote, "a journey through loss, growing up and getting older. Letting things go and learning how to move on. Asking questions that don't have immutable answers, telling stories that don't necessarily have happy endings. Coming to terms with things you can't change or control. Mood music not for elevators", end quote. Sounds more like perfect match and music for suicidal booths (not to be confused with suicidal boots as those are made for walking... off the cliff). The future is bleak and if that's the case, Nine Stones Close are having a wonderful time looking out through black tinted windows. Neat, how many other supposedly sorrow-thinking prog acts are you supposed to listen to before you simply had enough? To be perfectly honest, Nine Stones Close are quite good at what they do. The influences on the gloomy textured sound are quite diverse, but, wolven deep into the layered fabric of songs that reeks of Camel, Pink Floyd and Porcupine Tree. The guitar work intones a style similar to David Gilmour and the songs are overall more towards the old school sound than recently released prog albums. The keyboard sound is definitely old school and not quite as dramatic and atmospheric as the work of fellow label act Greylevel. The musicianship throughout the 15 minute epic "Thicker Than Water" add a nice dimension, but unfortunately it's nothing most old prog rock bands haven't already done back in the days. Don't get me wrong, it's a nice little gloomy album, it's just not up to pair with the you-know-what release (see above).